ABOVE: The U-shaped Marittima cruise basin is at the western end of the city, next to the Tronchetto parking island and the causeway to the mainland. San Basilio is behind the white ship just to the right of Marittima. Our excursions partner, Viator, offers departure transfers from Venice hotels to the Marittima or San Basilio cruise piers by private water taxi. Arrival transfers are also available. Venice is one of the busiest cruise ports in the Mediterranean, with nearly 500 ship departures and 700,000 cruise passengers per year. 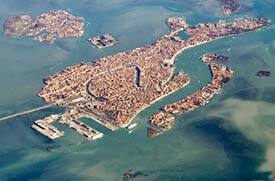 The city and its cruise-ship piers are inside the Venetian Lagoon, which is connected to the Adriatic Sea by a narrow entrance called the Porto di Lido. 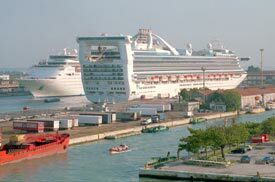 The Terminal Venezia Passeggeri or Venice Cruise Terminal is located near the 4-km causeway that links the historic city with the mainland. It consists of two main areas: the Marittima basin, which can handle the largest ships that call in Venice, and the San Basilio pier, which is just around the corner in the Giudecca Canal. Embarkation arrangements can vary according to your cruise line, where the ship is berthed, whether you're handling your own transfers, and when you arrive at the port. Check with your cruise line ahead of time if you're uncertain about the embarkation procedure. The cruise terminals do have left-luggage (baggage storage) offices. Opening hours may vary by season or even by day, so check ahead with the port if you absolutely need to store and retrieve your luggage on a certain day. If you want to store baggage in the city before going to the cruise terminal, look for the deposito bagagli, or left-luggage office, in the Piazzale Roma opposite the ACTV ticket office (next to the Pullman Bar). Alternatively, you can try the deposito bagagli office in the Venice Marco Polo Airport arrivals hall or in the Venice Santa Lucia Railroad Station. See our Venice Left Luggage article for more details. Important: We can't vouch for the hours of deposito bagagli offices on any given day. If knowing this information is critical, you'll need to check with the offices themselves ahead of time. Marittima is a 15- or 20-minute cab ride from Venice's Marco Polo Airport. The fare is likely to be in the €30-40 range. Marittima is only a couple of minutes from the Piazzale Roma by taxi. A free shuttle bus normally runs on Saturdays, Sundays, and Mondays during the cruise season. Alternatively, take the new Venice People Mover from the Piazzale Roma, which will drop you off at the entrance to the Marittima ship basin. You can walk to Marittima from the Piazzale Roma in 10 to 15 minutes. Just follow the road that leads to the causeway and turn left at the port entrance after you cross the railroad tracks. Take a taxi (if you can find one), ride the quick and inexpensive Venice People Mover one stop to the Marittima ship basin. Note: You can buy Venice People Mover tickets from a machine as you enter the station, which is along the water behind the main garage. "People Mover" signs will help you find the station. The Alilaguna airport boat's Linea Blu ("Blue Line") continues from to Marittima from San Marco during the cruise season. The trip takes 22 minutes. Alternatively, you can take a water bus to the Piazzale Roma and proceed from there by taxi, bus, or on foot if you aren't traveling with too much luggage. The No. 2 express boat is quickest; the No. 1 vaporetto down the Grand Canal is handy if you've been staying near one of the intermediate stops. See our vaporetto routes article for more information. Cruise lines sometimes provide free shuttle boats between Marittima and San Marco, either at the beginning and end of a cruise or during port calls in Venice. Ask your cruise line if a shuttle is available. You can reach San Basilio in a few minutes by land taxi. Water bus line 2 serves the San Basilio ACTV stop. See our vaporetto routes article for more information. It's also possible to walk to the San Basilio cruise terminal from the Piazzale Roma in 30 minutes or less, but you'll need a good map and a willingness to haul your luggage over a number of bridges. Take the vaporetto (see above) or walk along the Zàttere to the small wooden bridge just past the San Basilio vaporetto platform. Cross the bridge shown in the photo above, and you're there. ABOVE: San Basilio has its own ACTV or vaporetto stop. A wooden bridge leads to the Zattere promenade (foreground) and Venice's historic center. San Basilio is a long quay that runs from the main port area to the Fondamenta Zàttere, the promenade along the southern edge of the historic center on the Giudecca Canal. It accommodates small to medium-sized ships alongside the cruise terminal or at Santa Marta, an extension of the San Basilio pier. Take the vaporetto (see above) or walk along the Zattere waterfront promenade to a small wooden bridge just past the San Basilio vaporetto platform. Cross the bridge shown in the photo above, and you're there. 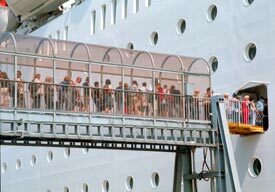 ABOVE: Passengers board a Costa ship at the Marittima terminal. Here's how to reach Marittima or San Basilio from the airport or railway station by bus, land taxi, airport boat, or water taxi. 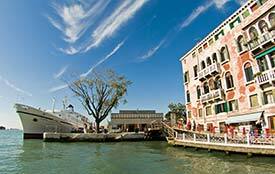 Also see Transportation from the Cruise Port if you're arriving in Venice on a cruise. Our article describes hotels near the Piazzale Roma (for Marittima), San Basilio, and the shuttle pier at San Marco-Vallaresso. Also see 17 hotels closest to cruise ships. These articles give detailed information on how to arrive in Venice and get around the city by land or water. Not sure where to leave your bags? This list of possibilities will point you in the right direction.